What resources can I add custom metadata for? What types of custom metadata can I add? How do I add custom metadata? Lifecycle Manager, an Akana product, is a metadata repository and SDLC management product that enables enterprises to effectively collaborate between business, developers, and IT operations, resulting in rapid development and deployment cycles while increasing reliability, stability, and availability of their APIs and supporting assets. Lifecycle Manager provides an intelligent inventory of assets and includes their relationships to each other, to the technical infrastructure, and to the company's business architecture. Using Lifecycle Manager, organizations can accelerate reuse and SOA initiatives, as well as improve the governance over production and consumption of services and other reusable assets. Application developers, business analysts, and technical and business architects can search the repository for the company's SDAs, to identify those that best match business and technical requirements for application development and integration. When integration between the developer portal and Lifecycle Manager is set up, the developer portal supports custom properties for certain resources in the developer portal (apps, APIs, and users). In the context of the developer portal, custom metadata is information about a resource that isn't part of the standard data on the platform. For example, standard data about users includes first name, last name, UserID, and password. Using Lifecycle Manager integration, you could modify the platform to collect additional data such as company or job title, and to send that information to Lifecycle Manager. Users; for example, you could add a Company or Notes field on the user profile. Add an API. See How do I add an API? Add an API version. See How do I add an API version? Edit an API or API version. Add an app. See How do I add an app? Add an app version. See How do I add an app version? Edit an app version. See How do I edit an app version? View app details. See What information is available on the app's Details page? The example below shows the extension to the Add App page when custom properties are added. The user sees these additional values when adding an app. Some of the values are required. Self-signup page: Only required extensible fields are displayed. Signup Activation link: Only required extensible fields are displayed. Update Profile page: All extensible fields are displayed. Invite User: Only required extensible fields are displayed on the Signup Activation page, which the invitation code links to. Add User when user is added by the Administrator: All extensible fields are displayed. Log in as LDAP user: Only required extensible fields are displayed on the Signup page, which the LDAP signup invitation code links to. Log in as Google/Facebook user: Only required extensible fields are displayed on the Signup page, which the Google/Facebook signup invitation code links to. The platform supports many data types for extension properties, including Boolean, date, string, taxonomy, and others. Fields can be required, optional, or read-only. The implementation must include the integrated Lifecycle Manager product, configured to use the same database as the developer portal. The applicable site setting (in Administration > Site > Extended Properties and Workflow) must be enabled. When this setting is enabled, properties defined for assets in the developer portal, such as apps and APIs, can be extended by modifying templates in an integrated Lifecycle Manager. 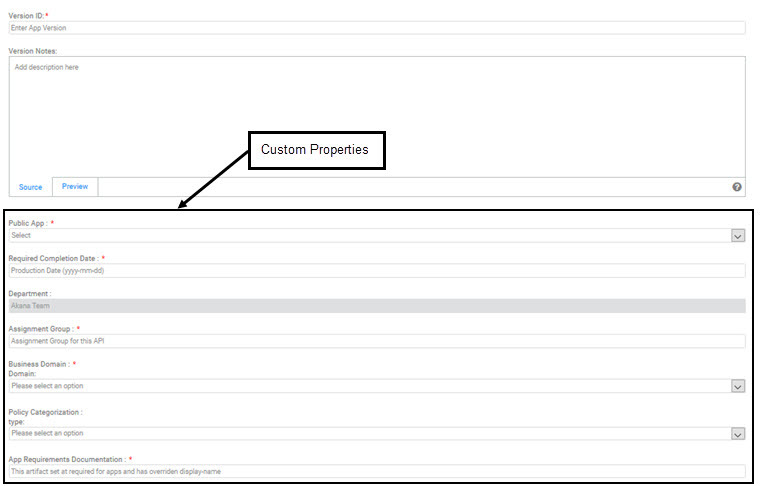 When a tenant is created with the Extended Properties and Workflow flag set (or the flag is later enabled) a corresponding library of assets is created in Lifecycle Manager. The default configuration for this library includes templates already in place that represent the fields for Users, APIs, and Apps. However, the templates do not include any custom fields. Initial templates: Use these to define custom optional and required fields that are presented in the developer portal user interface when a resource is created. In the Initial template, you can also indicate that a field is read-only. This locks it down after the resource has been created. Specified templates: Use these for additional custom fields that appear in the edit properties in addition to the fields defined in the Initial templates.